Rich: She is a marketing consultant specializing in search engine marketing and LinkedIn lead generation. She’s a published author, international speaker, entrepreneur, and the founder of Wizard Media, a digital marketing agency that helps businesses leverage search engines and LinkedIn to get more clients. She’s taught over 4,000 people worldwide how to generate more and better leads for their business, and has helped several companies add an additional six figures to their bottom line using her marketing strategies. She has been mentioned on Inc.com, Entrepreneur.com, and Forbes, just to name a few. I’m very excited to have on the show Jimena Cortes. Jimena: Hey Rich, how are you? Rich: I’m doing well, how about yourself? Jimena: Very good. Thanks for having me on your show. Rich: I am pleased as punch to have you here. So let’s jump in. And I guess my first question is – I know you’re an expert in both LinkedIn and SEO – but I have some questions about SEO. I’m curious how you got started in search engine optimization. Jimena: It was really kind of by accident and kind of necessity. Back in 2009 I was working at a marketing company running traffic and that sort of thing. But I started a side project that was this website that I was selling different products and I had a drop shipper that was doing all of that. Back then funds were tight so I had to do whatever I could to get as much traffic to the website without having to pay for so much traffic. The kind of campaigns we were running were like $100,000-$200,000 a month in paid ads, and there was no way I could do that for this site. So I thought, well SEO is “free traffic” – which it’s really not because you’re either putting a lot of money into it or your time – but back then that was my thought process. And I knew I needed free traffic to my website so let me do this SEO thing. So I started playing with it for a little bit, but because I had a fulltime job I didn’t really have the time to really devote to it, so I decided to hire a company out of India. They said yeah, we can do your SEO and it sounded great and they looked great, they sounded like they knew what they were doing, and they also said something that got me on the hook. They said if after 3 months you’re not ranking, we’ll continue to work for you free of charge until we get these keywords that we’ve chosen to the top of Google. So I thought that was a great deal. So three months come and go and I’ve paid my dues and I’m no way near the front page of the Google. And if you’re not on page one – especially in the top 3 spots – you’re getting no traffic. The closest keyword I had was on page 8. So I went back to them and said this was not our deal, and they said I needed to pay or another month. And I told them that’s not what you said. And they said they didn’t do free work. So I said forget it, I can’t afford this, so I ended up just learning it myself. And within the next three months I was able to get most of those keywords in the top 5 spots on page one of Google. So after I was able to do that, forget the ecommerce side, I really fell in love with the process and the power. Because if you think about it, what better time to show up in front of a potential customer except for when they’re actually looking for what you have to sell. Jimena: So that’s what kind of started my journey into not only optimizing that website but then also quitting the job and going off and starting my own marketing company offering SEO services for local businesses. Rich: Awesome. And hopefully you were much more honest than those people that you worked with before. Rich: So I was reading some of the stuff that you had put together before the show and you talk about three types of queries or searches that people do at the search engines. Can you run through them for us and just kind of explain what each one is? Jimena: Yeah. So the first type is a navigational query. So that’s really when you’re looking for a specific site. If I know I’m going to go buy something on Etsy or Amazon, I might type into Google, “amazon.com”, it’s like brand-related keywords. The next two is really where we focus a lot of our efforts on an informational query. So that’s basically if you’re looking for a specific type of information and you’re looking to learn something. And then the last one is really where all the money is made and is what we like to call transactional queries, and that’s when I know there’s a certain type of shoe that I want to buy and I’m going to type it and I’m going to find the shoe. Or there’s a service that I need – I need to get my car repaired or a dental implant or whatever – that’s a transactional query. When we’re doing an SEO campaign we’re really focused on the last two to drive traffic by educating your prospect on your products or services why they should do business with you. But also if someone is being super specific and they have the model # and everything of what they want to buy, you bet you want to come up for that search, because that person has already done all the research and the credit card is basically in their hand. Rich: Exactly. So navigational, informational, and transactional, what we’re really focusing on is the last two – informational and transactional – and it sounds like informational is pretty much the top of the funnel, and transactional is really the bottom of the funnel. Jimena: Yeah. And I’d love to talk about a simple example let’s say I need to get dental implants, so I can do a search for “dental implants” and click around different websites. But instead of clicking around sites, I might start making that search a little longer and start saying, “dental implants for the front tooth”, or “what do dental implants cost in Las Vegas, Nevada”, or another one that I saw that was really popular was “dental implants cost in Mexico”, people are doing a lot of medical tourism nowadays. So I can start to look at all of these things and if you know that’s what people are searching for, you want to make sure that you’re coming up for all those different things. Especially if somebody is considering going to Mexico, maybe you want to have a blog on your website talking about why you may not want to do that and go to your office instead. Rich: Absolutely, I couldn’t agree more.Alright, so what are the opportunities then for informational? What should we be thinking of in terms of trying to create content or doing the searches for something that’s informational versus transactional? Jimena: Sure. So what I love to do with informational – and this really helps the over SEO campaign – is to come up with keywords for questions that people are asking for. So for example, a lot of times people ask the cost for certain things or comparisons or what things mean, so what we’ve found with some of our campaigns – and we focus a lot with doctors and lawyers and those types of professionals – what we found is that when you’re creating content on your website and the title of your blog post is that particular question, a lot of times you’ll come up for other things, but you’ll also come up for that if that’s a blog pot that you wrote about. So I’ll have the website come up on page one, then I’ll have the blog post come up as well. So now what’s happening is that you’re taking up multiple spots on that very highly coveted page one real estate that we’ve got on the search engine. So that just helps you bring in additional traffic, but also you’re answering those questions that your customers are asking. And you want to be found when they’re in that informational mode of “what do I need to know, now who do I pick to buy from”. Rich: That makes sense. So how do you know – or how do you find out – what our people are searching for in Google? Jimena: I think that’s a really important question. This is one of the first things that we do when we start a campaign is doing that keyword research. One of the things that we always ask our clients to do first is give me a list of keywords that you think you want to rank for. And they’ll usually give you something super broad so you obviously have to work on that. But at least I have a place to start from, and we just start putting in different queries into Google. So even just going back to the dental implant example, if I type in “dental implants” into Google, there’s actually a little place right there that says, “People also asked, ‘can you get dental implants on the NHS?’” and all these questions. And then if I scroll down even further it also gives me the latest searches to this query that I made. So you just keep doing that over and over and you put this into an Excel spreadsheet, now you’ve got the questions people are asking and things that people are actively searching for related to that product or service. And then the other way that we also like to get our keyword search potentials is just a little bit more advanced. But we use a software called Ahrefs, so it’s ahrefs.com. So basically you go in and put in your competitor’s website – and there’s multiple companies that will get you this information – but you can put in a competitor and you can see some of the related terms of how traffic is finding their website. So that’s another competition research that you should be doing anyways for getting those potential queries for you. Rich: So I’m glad you mentioned that because actually one of the other things I was reading that you put out there is this thing about finding accidental keywords on big competitor’s websites. Because I’ve actually never used this method before, so I was intrigued by that. Walk me through that process. Jimena: It’s really just as simple as going into Ahrefs and putting in their website and just looking at the information that comes up, and doing that with several different competitors you’ll see what the traffic is and it also gives you a guess-timate of how much traffic they’re generating. So that’s another thing that we also look at, and we also look at how potentially difficult it might be to rank for certain terms based on the websites that are showing on page one. If I see on page one it’s a bunch of really big companies that have a really strong SEO, I might back down form that particular query and go for something that maybe has less traffic but is a little bit easier to rank for. So it’s kind of a time consuming process when we start an SEO campaign, especially in the beginning. Rich: Right. In the article that I was reading, you actually – because Ahrefs for anybody that didn’t know, this is a paid service similar to Mozor SEMRush– but these all cost money. You were actually using Keyword Planner, I believe, the free tool from Google if you’re signed up for their Adwords account. Instead of putting in keywords you were putting in websites of competitors and then they were spitting back some of the keywords that those companies were ranking for or whether or not they were trying to rank for them or not. But this might be some opportunities for you, is that correct? Jimena: Yeah, the keyword banner has changed a lot since I wrote that article, so we really moved away from using them for that. That’s why I used some paid software now. I used to get away with just using that and be good, now with all the changes I kind of have to go with the paid companies. Rich: Well it’s funny that you say that, because of course as soon as I read that I went, “Brilliant!” I jumped onto Keyword Planner and I put in this one competitor of ours – I’m not mentioning any names – but they annoy me because they don’t seem to be doing anything right but they’re always ranking well in both organic and local for the same terms It didn’t even mean anything, it was two nonsense words. So I’m like, is this a glitch? So I put in another competitor and it made a lot of sense. It was things like “web design in Portland, Maine”, “web design Maine”, “SEO Maine”, all those kinds of things both of us would want to rank for. For some reason that other company – whether it was a glitch or whether they’ve done something so sneaky that Google can’t even figure it out – I don’t know, but I’m glad to hear that I’m not crazy and that may not be the right tool anymore and you may have to upgrade to one of these paid tools. Jimena: Yeah, but the thing is too with these paid tools, a lot will have a limited time free trial or low entry fee kind of thing. So if you know exactly that you’re going to get started and want to work this out, just knock it out during the free trial, and off you go. Rich: Yeah, that’s true, too. And I tell a lot of people the same thing. You can start with the free version of the software, and if you find that you keep hitting your head against the ceiling, then it’s time to start paying. Rich: Ok, so let’s say that we’ve done the research and we have some good sense of what kind of keywords that we want to be targeting. Any recommendations on how to take that information and then either update current pages, or create new pages, or create new blog posts? How do we want to leverage the information we’ve just gathered into a tactical way of actually starting to rank higher? Jimena: Absolutely. So I always want to put the most important keywords on the homepage, we always update the title tags. And you can see the title tags, that’s what shows up in Google when you do a search on a website’s title tags. So you want to have your keywords there, you also want to have a Meta tag, which is the description letting Google know what this page is about. So we want to do that for all the pages on our website. A lot of times what I notice that companies will do is on that title tag they’ll just put “homepage” or they’ll put their company name. But if all you’re putting is your company name there, the most you’re going to come up for is your brand name, your company name. And if someone is typing that in, they already know you exist, we’re trying to get new people that don’t know you exist. So you want to be putting your keywords there, but also you’ve got to think about this like advertising. If you’re coming up on Google and someone is finding you and 10 other people on that particular search, you not only want to put keywords there but you also want to write it in a way that would entice somebody to click on it versus the guy above or below you. So you want to write compelling copy is really what I’m getting at. And it’s not all about just attracting traffic to your site, we want to have copy on our website that has the keywords that you want, that educates our customers, but also converts. So that’s something that you’re just going to have to do via testing. Rich: So we’ve talked about two types of searches that we really want to be thinking about answering those kinds of queries, and those were informational and transactional. So I can assume that if we’re writing posts or articles or web pages to respond to informational posts, we might be writing differently than if we’re really just trying to close on the sale if it was a transactional search. How do we move people into transactional mindsets at our website? Does that come down to copy, are there other tactics that you use to get people in the sales funnel? Jimena: Yeah, I’m actually really glad you asked this. The more transactional queries, that’s where we want to be targeting those users on the main pages on our site where we’re actually selling something. But you want to write copy on those pages that say this is what it is, these are the benefits, and here is the result of people using this. So it’s kind of like social proof. I like to sell with social proof if I have it. What are the benefits? No one cares about whatever this thing is, they care about what it’s going to do for them. So really focusing on that and on the customer. And also doing the same thing from your blog post. If you’re writing a blog post around a question, obviously answer the question and educate them on it. Inside that blog post you can include a case study or two of work you did or that your product did that the customer – that person that’s typing in the informational query – is now subconsciously being sold on it through the blog post. And then you can have a link on the blog post to the page on the main site where the product or service is being sold. You want to have all of that right there. Rich: Alright, so if I’m thinking about creating content or updating the content on my website, I’m thinking first about those transactional searches, and I want to answer all those questions and queries on my web pages, which I think of as my sales pages. I really want somebody to fill out my contact form, click on the “buy now” button, sign up for my email newsletter, and download something along this route. But mostly something along the transactional side. If I’m trying to target the informational, I might think more about writing blog posts that answer a series of questions on everything from whether it’s dental implants, or email marketing, or gluten-free diets. So those would be more informational to educate my client, with a link form all those different blog posts to the transactional sales page. And that’s how we move people further and further through the sales funnel. Rich: Perfect. Alright, cool. So what other tactics, is there anything in the psychology of SEO that we haven’t talked about that will help us convert a higher percentage of visitors no matter where they are along the lines? Jimena: Yeah, I think we covered some really good stuff. I do want to make one mention. A really great tool you can use that still works and we’ve been using for a long time, is Google Insights. So if you go to Google Insights, it’s justgoogle.com/insights/search, you can type in some of your keywords and you can see the trend of search volume over time. So another thing that you want to consider is, even if you’re just starting a business, this is just plain market research if you really think about it. If I’m going to go into business and start selling something and I notice that the interest is going down over the years, it’s probably not a business I want to really get into. But if you see it’s going up or remains steady, then that’s something I would consider. Rich: That makes a lot of sense. Are their mistakes that you’re seeing small businesses make time and time again that you wish they would stop making when it comes to SEO? Jimena: Well the first one is just not doing anything at all. Like I said, the kind of traffic if they’re so far down the buying funnel, like if they’re searching for this, they’ve already made the decision that this is something that they want. Versus other times with advertising you’re kind of interrupting by putting an ad somewhere and you’re hoping they get interested enough to want to find out more because they weren’t particularly thinking of that at that time. So it’s a really powerful way to market. What I also see people doing wrong is not understanding what they’re getting into. So if you are going to do SEO and you are going to hire somebody, just learn a little of the basics so you don’t get taken the way that I did. Make sure you see that they have to do the keyword research, they’ve got to advise me the first thing they’re going to do the first month is optimize your website, and then there’s content and all the stuff that they need to do. Make sure you know who you’re hiring and what they need to be doing and send you reports. A lot of times I come across clients who have been burned in the past and that makes it more difficult for us to even get the client even though we have a great track record, because they’ve been burned by people that take their money and not do anything. You really need to know what they person needs to be doing. It’s time consuming so you definitely don’t want to be doing it yourself, but you want to know a little bit about it first. Rich: Absolutely. Well this has been great and Jimena I’m sure that a lot of people will want to check you out and learn more about you, and see what you’re up to. Where can we find you online? Jimena: So I’ve got two different websites. One is for our agency, wizardmedia.net, that’s our marketing agency. And then just to find out more information about me personally, you can go to jimenacortes.com. Rich: Awesome. Well this has been great, Jimena, thank you so much for your time today and your expertise. We appreciate you stopping by. Jimena Corteslearned the hard way that it pays to at least know the basics about SEO for your business. 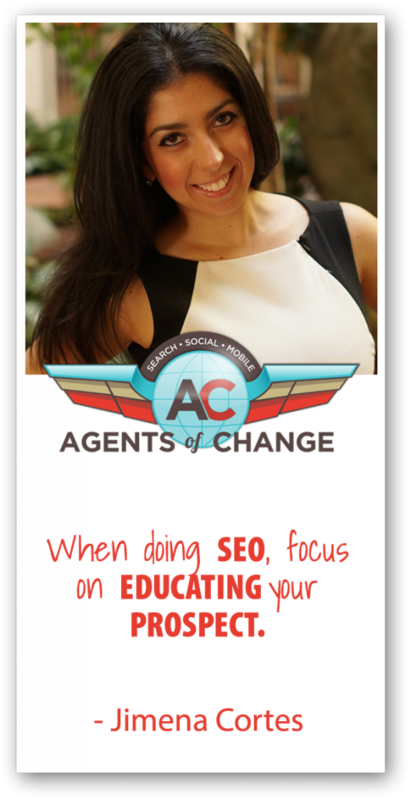 She’s turned her early bad luck into valuable SEO strategiesfor businesses that are proven to increase sales, visibility and lead generation. Rich Brooks is the President of flyte new media, a web design & digital marketing agency in Portland, Maine. He knows a thing or two about helping businesses grow by reaching their ideal customers, and to prove that, he puts on a yearly conferenceto inspire small businesses to achieve big success. You can also head on over to Twitterto check him out, and he has added “author” to his resume with his new book!